Ram Promaster Forum > Ram Promaster General Discussion > Promaster General Discussion Forum > What switches are you happy with? For aux things, driving lights, interior lights. What switches are you happy with? For aux things, driving lights, interior lights. Soon, I'll be coming to the part of my build that involves switches for various items (outside flood lights, interior puck lights, water pump, everything). What are you using that you are happy with? What should be avoided? It's tempting to go with some of the inexpensive switch banks from Mictuning, et. al. But I might want to do something more custom. Use different kinds of switches (momentary, missile (protected), double-pole double-throw, etc.). Different coloured LEDs for each switch to help locate the correct one in the dark. Anyone make a custom switch bank? Difficult? Special tools needed (to cut out the rectangular holes)? I have the requisite crimper and various connectors. Can custom labels be made? Can labels be back-lit? 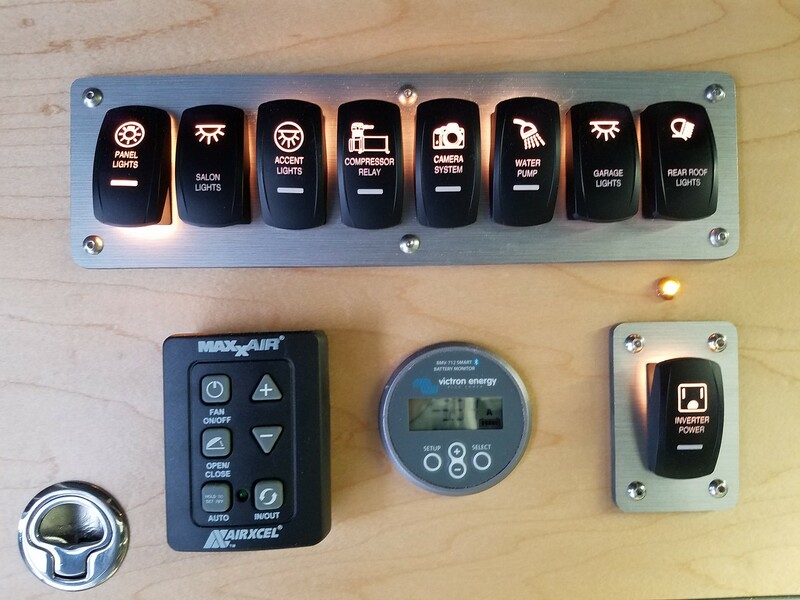 I plan to add a bank of switches by the centre console, some switches by the slider doors (I have both sliders) for interior lights, some by the back doors (garage light, rear floods), some by the galley (water pump, hood fan(?)). A challenge that I'm fantasizing about is making some of the switches at the front ALSO control the lights that are controlled elsewhere. For example, there'll be a switch at the back to control a pair of rear-facing flood lights. But I'd also like to turn them on from the driver's seat (e.g. to get more light when reversing in the dark). Has anyone done something similar? I *think* I've got the needed circuit planned out ok. I may post it for critique by others who are more familiar with automotive electrics. Related question: how necessary are relays? It used to be that for many exterior incandescent lights, relays were needed due to high current (50+ watts). Now a 6 LED light that's quite bright uses only 18W. Interior puck lights use much less. I've heard relays are cheap but the last one I replaced on my dad's Lexus wasn't that cheap. Maybe low powered ones from the usual online stores are now inexpensive. Who uses relays everwhere? All the switches come from https://rockerswitchpros.com/switch-bodies/ (but I did not like the one custom switch cover I ordered.) They have nearly every kind of Carling rocker switch you could need and execellent documentation. All custom covers come from https://www.otrattw.net/ Switches are laser cut for back lighting. In the picture the one yellow indicator light is because the rear porch light is on a thee way switch. 3 way switches don't (usually) "know" if the thing they are powering is actually lit because it depends on the state of the other switch. So, I put this light in so that one can tell at a glances what the state of the rear light is. At the passenger slider I have a 3-way to the main interior lights (salon) and a on-off-on to the floor lighting. On (up) is on. On (down) is on a motion sensor. The back light on the switches only comes on when the circuit is closed. At the rear I have a 3-way for the rear porch, a 3-way for the garage lights and the compressor light. The back light for these is only on if the compressor relay (controlled at the main panel) is charged. I needed a relay for the compressor because it takes 30A. Everything else is well under that, so no relay. Non-lexus relays are cheap, but not really needed much. Three way (and 4 way) circuits are not hard to wire, if you draw it out first. I skipped any dimmers because I tend to just use them as "100%", some mid point and off. I just split my lights into banks to get that mid point lighting. 2017 159" Gas High top with dual sliders. Thanks, Thom. You have a very nice array of switches. Sometimes I like a "hard off" for all interior lighting when I'm creeping about in stealth mode. :-) No lights come on when I open any door. I do have it setup as you describe - off, on and motion controlled. I use this setup for the floor lights. Now my brain is busy thinking about how to tie this into my security system(s).